DUBAI MEDIA CITY, UAE - Nov. 21, 2017 - PRLog -- "One Music X", a collaboration amongst ABS-CBN TFC, Star Music, Myx, MOR For Life and One Music PH, promised to be the next biggest festival to watch in the Middle East and based on the promo tour the day prior and the reactions from the actual crowd that day at Dubai Media City Amphitheater, the event truly delivered. On November 3, the iconic DMC Amphitheater lit up as over 5,000 Filipinos, including other nationalities, made history as together, they witnessed one of the most memorable experiences of their lives – a day of performances from the best artists the Philippines has ever produced together with Dubai-based international acts; a rare opportunity to reconnect with friends and even family; and most of all, a momentous time to be proud of Filipino heritage and culture in a global platform. Truth be told, "One Music X" gathered the best Filipino artists of their generation in one night and from start to end, the audience was hooked. 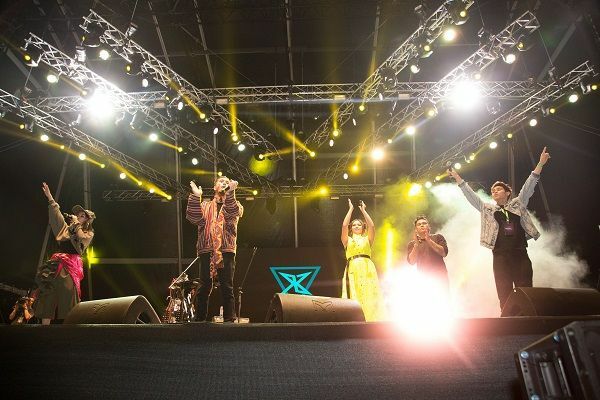 "One Music X" successfully revved up the audience when The Next Big Thing in Homeland EDM, Moophs opened the concert segment of the newest music festival in the region. The ladies in the house swooned over Moophs, and even labelled him "Hunk DJ" as he set everyone in a trance with his performance and charm. The EDM vibe accelerated further as EDM artist and theater actress Xela joined him on stage. From EDM to mainstream, "One Music X" continued the music festival vibe with Teen Heartthrob Inigo Pascual. Pascual excited the younger audiences, eager to hear fan-favorite "Dahil Sa Iyo (Because of You)". Meantime, Pop-Rock band Silent Sanctuary was equally thrilled as their fans were as it was their first international performance to date. The band, known for bringing together classic and rock music, or rockestral, performed their most popular hits such as "Sa 'Yo Lamang (Only Yours)" among other musical feels where a lot could relate with. Soul Supreme KZ, long known for her passion-filled performances, continued to amaze the audience this time in Dubai, at how great of a performer she was on stage, drowning in the words and melody of her music that included "Litong-lito (Confused)". Bringing to the "One Music X" stage her music history of top-raters, Yeng Constantino brought the house down while festival-goers sang to her every song such as "Ikaw (You)". Finally, closing the performances that night was the much-awaited set of rock icon Rico Blanco. The Super Composer, Concert Master and Bestfriend Korics seemed to have captured his audience and brought them to his own world as he performed all-time greatest hits and solo performances such as "Your Universe" . True to its promise of becoming a fusion festival of sorts, "One Music X" also brought together Dubai-based local acts such as Club 7 and top Dubai-based indie acts such as Australian R&B singer Josh McCartney and Seychellean reggae artist Emmanuel Marie who matched the Pinoy vibe with their international sound. Completing the "One Music X" artist line-up was Myx VJs premier host Robi Domingo who was a crowd hit; homegrown favorite VJ Ai dela Cruz and MOR For Life's DJ Chacha. Outside the music festival, "One Music X" was a multicultural experience as well, bringing together iconic Filipino crazes and more "YOLO (You Only Live Once) or 'Instagrammable' moments. All factors considered "One Music X" was a successful festival. But beyond the numbers in multitude, "One Music X" succeeded in bringing that piece of the homeland especially for Filipinos in their lonesome in Dubai. Online netizens were also one with the whole experience as they enjoyed it via streaming. Much as the audience was exhilarated to be part of the music festival, the ABS-CBN executives were humbled at how the first "One Music X" made such huge impact for the Filipinos in UAE. Roxy Liquigan, Head of ABS-CBN Star Music Group added: "One Music X seemed daunting at first given that it was the first initiative that required bringing together six huge groups: TFC, Star Records, Myx, MOR 101.9 and One Music PH. Based on actual feedback, we realize that One Music X hit the spot. Our deepest gratitude go out to the ABS-CBN executives for trusting us and our Kapamilyas for supporting us". ABS-CBN Global Managing Director for North America Olivia de Jesus, who personally witnessed how "One Music X" made history, also shared her pride at the teamwork displayed by the various entities. De Jesus revealed: "I am amazed at the creativity, talent, and gigantic effort that went into the making of the first Filipino music festival in Dubai." De Jesus added: "The challenge was more pronounced because Dubai has a very dynamic market. From a destination of choice for skilled Filipino workers, the country has evolved into a vibrant market with more young Filipinos coming to the fore. I am especially proud that TFC, together with Star Records, Myx, MOR 101.9, and One Music PH, has been able to evolve with the market, creating One Music X – an event that speaks and resonates with them". Truly, "One Music X" turned out to be not just an experience but a legacy of sorts, promising to bring the same kind of experience elsewhere in the Middle East and perhaps, the rest of the world. Experience "One Music X" all over again via TFC online (TFC.tv) and internet protocol (IPTV) starting November 17.